The Frugal Family Life: New $1/2 Keebler Townhouse Coupon Plus Walgreens & Homeland Scenarios! 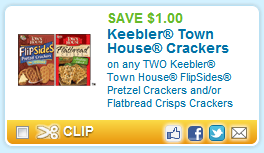 New $1/2 Keebler Townhouse Coupon Plus Walgreens & Homeland Scenarios! There is a new $1/2 Keebler Townhouse FlipSides Pretzel Crackers and/or Flatbread Crisps Crackers available today! Just use zip code 52801. These are on sale at Walgreens this week where we could get them for just $1.25 per box! Final Price: $5.00 for all FOUR, or $1.25 per box! These may also be included in the Townhouse sale at Homeland this week. If they are included we’ll get them for only $1.00 per box.